This past week, the university hosted two big events, Founders Day Challenge and Odyssey Day. Both of these events generated publicity for the university, but more importantly, they also helped the university with its future in financial status and enrollment goals. On Tuesday, April 10th, the university celebrated its annual Founder’s Day, commemorating the 131 years since the university was founded by Pope Leo XIII in 1887. Initial estimates show that the university raised $562,746 with 1,465 donors, according to Patrick Davey, director of the CUA Fund. This is significantly higher than what was raised last year, $324,678 with 967 donors. However, this year, this fundraiser was about more than just raising money, according to Davey. All throughout the day, there were many different ways in which one could donate. One was in person at the many table locations all over campus. At these table locations, students could donate with cash or use their Venmo money-transfer app, which offered an easier method for students not carrying cash to contribute. A new effort this year, Venmo donations accounted for 10% of the number of people who donated. A second option of online donations totaled for a big sum of the money donated. Donors could give any amount of money to a specific academic program, athletic team, or student life initiative. They could also donate to an unspecified option called the CUA Fund that will distribute the money raised to areas in need. The most popular designations from Founders Day included Campus Ministry, Catholic University Scholarships, the Mullen Library, and the Dean of Students Office. Social media played a big part in the success of the challenge, with people posting pictures in their Founder’s Day t-shirts and sunglasses, prompting others in the community to donate to either the university in general or their specific team or organization. 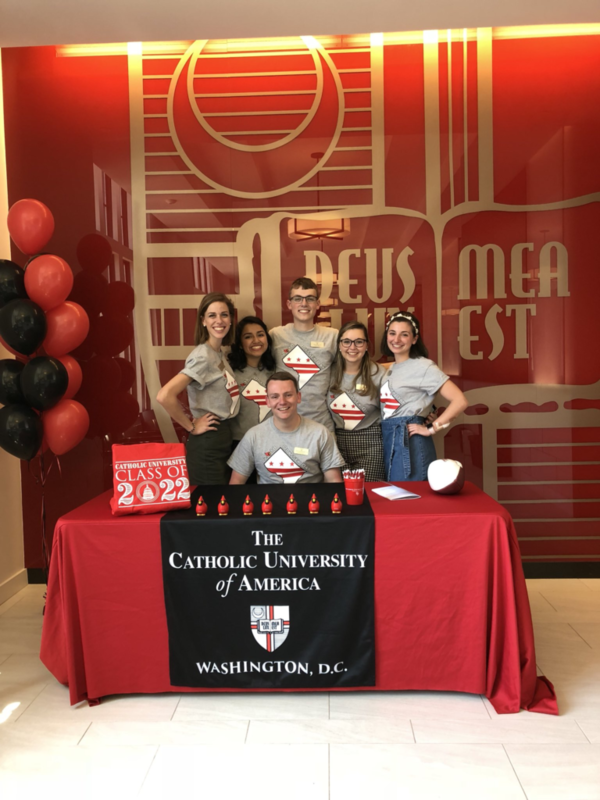 In getting the word out there, the challenge was spread to more people and encouraged more donors to help CUA reach its goal for the challenge. More than 190 faculty members and 100 students supported the challenge, with their total money raised exceeding $22,000. Davey said that although it was incredible to receive large donations, “it means a great deal to be able to have support from a significant number of people from our own community,” which is why the event was considered a successful venture for the university. In terms of financial success, another important day for the university was Odyssey Day, an all-day admissions event hosted for accepted students as a time for them to come visit campus before their college decision deadline on May 1st. Almost 500 families attended the event that took place on Friday, April 13th. Forty-five students officially committed to Catholic, placing their deposits that day. According to Katherine Fainer, the Associate Dean of Undergraduate Admission, there was a greater amount of students than in the previous two years. Days like Odyssey Day give students the ability to come to campus and get a feel for the university as they make their decision on where to attend in the fall. All factors including students, staff, and even weather can affect a student’s decision. Since Odyssey Day, 117 new students have put down their deposit to be a part of Catholic’s class of 2022 and attend the university. This year’s Odyssey Day may have convinced some still-undecided high school seniors to choose Brookland as their home for the next four years. During a year in which enrollment numbers were cited as a cause for the university’s financial challenges, the success from both Founders Day and Odyssey Day projects a healthier fiscal future.